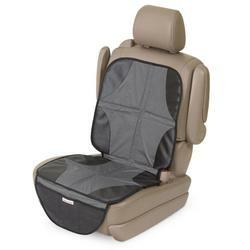 The DuoMat from Kiddopotamus protects your car's upholstery from dents and scratches from your car seat. The material that the DuoMat is made from is awesome! Not only is it waterproof (which makes for easy cleaning), but it is also non-slip so it stays place on turns and stops. The DuoMat can be used with car seats that are forward or rear facing, so it can stay in place as long as your child needs a car seat or booster. Back folds to the perfect height for rear facing infant seats. No need to worry about the mat falling over on baby. the DuoMat back folds open so all upholstery is protected.